Dec. 12 (Bloomberg) -- The dollar fell to a 13-year low against the yen and declined against the euro after U.S. Senate Leader Harry Reid said lawmakers were unable to reach agreement on a $14 billion bailout plan for the nation’s automakers. The dollar headed for its biggest weekly loss in eight years against the euro and a sixth weekly decline versus the yen, on speculation General Motors Corp. and Chrysler LLC won’t have enough cash to survive into the new year. The U.S. currency weakened to 90.67 yen, the lowest since Aug. 4, 1995, before trading at 90.69 yen as of 12:49 p.m. in Tokyo from 91.45 yen late yesterday in New York. It declined to $1.3389 per euro from $1.3352 yesterday. GM and Chrysler LLC are racing against the clock as they need federal aid to keep from running out of cash early next year. Pressure is mounting on GM as a small number of parts makers ask for payments in advance, people familiar with the matter said. Dec. 12 (Bloomberg) -- Crude oil extended losses after the U.S. Senate Majority Leader said the legislature failed to reach an agreement on a bailout for the auto industry. The negotiations on a plan collapsed, said Senator Harry Reid, in a blow to General Motors Corp. and Chrysler LLC, which may run out of cash early next year. Initial jobless claims in the U.S., the world’s biggest energy user, surged to a 26-year high, a sign that the companies are increasing their firings and the recession may deepen. Crude oil for January delivery fell as much as $2.40, or 5 percent, to $45.58 a barrel in electronic trading on the New York Mercantile Exchange. It was at $45.64 a barrel at 12:06 p.m. Singapore time. Reid said the Senate will take a procedural vote on a House-passed plan, though he doesn’t expect it to be approved. Brent crude oil for January settlement declined as much as $2.21, or 4.7 percent, to $45.18 a barrel on London’s ICE Futures Europe exchange. It gained yesterday $4.99, or 12 percent, to settle at $47.39 a barrel yesterday, the biggest one-day gain since March 1998. Dec. 11 (Bloomberg) -- Senate negotiations for a U.S. automaker bailout plan collapsed, in a blow to General Motors Corp. and Chrysler LLC, which may run out of cash early next year. The Senate began taking a procedural vote on a House-passed plan, though Reid said he didn’t expect it to get the required 60 votes. Asian stocks and U.S. index futures immediately began falling after Reid’s comments. The MSCI Asia Pacific Index slumped 2.2 percent to 86.13 as of 12:33 p.m. Tokyo time, while March futures on the Standard & Poor’s 500 Index slipped 3.4 percent. Connecticut Democrat Christopher Dodd, who helped lead the negotiations, said the final unresolved issue was a Republican demand that unionized autoworkers accept a reduction in wages next year, rather than later, to match those of U.S. autoworkers who work for foreign-owned companies, such as Toyota Motor Corp. Earlier today, White House spokeswoman Dana Perino warned that an agreement was necessary for the U.S. economy. “We believe the economy is in such a weakened state right now that adding another possible loss of 1 million jobs is just something” it cannot “sustain at the moment,” Perino said. Also earlier, South Dakota Republican John Thune suggested that if talks collapsed, the Bush administration might aid automakers with funds from the financial-rescue plan approved by Congress in October. “I think that is where they go next,” Thune said. “I wouldn’t be surprised if they explore all options.” The Bush administration thus far has opposed that option, which was favored by Democrats. Dec. 11 (Bloomberg) -- Gold prices rose to the highest in almost eight weeks as a sliding dollar boosted the appeal of the precious metal as an alternative asset. Silver also gained. Gold has jumped 9.9 percent this week as the dollar dropped 4 percent against a weighted basket of six major currencies. The metal reached a record in March as the greenback headed for an all-time low against the euro. Gold futures for February delivery rose $17.80, or 2.2 percent, to $826.60 an ounce on the Comex division of the New York Mercantile Exchange. Earlier, the price reached $835.30, the highest since Oct. 16. The metal was up for the fourth day in a row. Silver futures for March delivery climbed 22.5 cents, or 2.2 percent, to $10.425 an ounce. Gold is still down 1.4 percent this year, while silver has dropped 30 percent. Gold’s all-time high was $1,033.90 on March 17. The dollar tumbled as much as 2.6 percent against the basket of currencies. The U.S. currency still has gained 9.1 percent this year on demand for a haven after banks worldwide reported more $986.5 billion in writedowns and losses related to investments in subprime-mortgage securities. The Federal Reserve began slashing interest rates from 5.25 percent in September 2007 as the U.S. economy headed into a recession. Policy makers probably will lower the lending rate 50 basis points to 0.5 percent on Dec. 16, according to the median estimate of 82 economists surveyed by Bloomberg News. Yields on one-month U.S. Treasury bills fell below zero for the first time after rates on three-month bills turned negative on Dec. 9. Gold also climbed on expectations that the U.S. government’s attempt to stimulate growth and bail out banks and automakers will lead to inflationary monetary policy, analysts said. Gold is often used as a hedge against accelerating consumer prices. The U.S. has pledged more than $8.5 trillion and the Federal Reserve has committed as much as $800 billion. The Fed is also considering issuing its own debt as a funding source, rather than creating money. Dec. 12 (Bloomberg) -- Crude oil fell amid speculation yesterday’s 10 percent rally, the biggest increase in five weeks, was overdone as futures experience their most volatile trading in more than two decades. Oil is set for its biggest weekly gain since June 1998 after the Saudi Arabian oil minister said yesterday he had delivered cuts already promised to OPEC, a sign that world supplies are smaller than traders had estimated. Oil options volatility is at the highest level in 22 years as OPEC deliberates production cuts needed to revive prices from a five- month, $100 plunge. Crude oil for January delivery dropped 76 cents, or 1.6 percent, to $47.22 a barrel at 10:14 a.m. Sydney time on the New York Mercantile Exchange. Oil is up 16 percent so far this week, the largest one-week gain since June 1998, when OPEC slashed output by more than 3.1 million barrels a day. Yesterday, futures rose $4.46 to $47.98 a barrel, the highest settlement since Dec. 1. It was the biggest gain since Nov. 4. Ali al-Naimi, the Saudi minister, said in an interview that the kingdom pumped 8.493 million barrels of oil a day in November, close to its OPEC production quota of 8.477 million barrels a day. That’s 287,000 barrels a day less than estimated by the International Energy Agency. Saudi Arabia’s oil production was “absolutely” in line with its OPEC quota, al-Naimi said yesterday in an interview in Poznan, Poland, where he is attending climate-protection talks. He declined to comment further on OPEC policy. OPEC’s previous oil-supply cuts aren’t enough, and the group will need to make a “substantial” additional reduction at its next meeting, on Dec. 17 in Oran, Algeria, Shokri Ghanem, Libya’s top oil official, said in a Bloomberg TV interview yesterday. Oil has tumbled 25 percent since the Organization of Petroleum Exporting Countries, which supplies about 40 percent of the world’s oil, announced a 1.5 million-barrel-a-day output cut on Oct. 24 in Vienna. Prices fell as fuel demand slumped and speculation grew that some members weren’t complying with their agreed-on quotas. “The OPEC heavyweights are all serious about getting prices higher, so they will make the cuts,” said Sarah Emerson, managing director of Energy Security Analysis Inc., a consulting firm in Wakefield, Massachusetts. Russian President Dmitry Medvedev said his country, the second-biggest oil producer, may join OPEC and reduce output to support prices, RIA Novosti reported from Kurgan, Russia. Oil for delivery in December 2009 traded at a $12.08 premium to January futures, down from a $14.27 premium on Dec. 8. The shrinking spread may indicate that storage space for oil is scarce and that the crude is being sold on the spot market, said Stephen Schork, president of the Schork Group, an energy markets analysis company in Philadelphia. This price structure, when the subsequent month’s price is higher than the one before it, is known as contango. Oil options implied volatility for January crude oil, the major factor in determining options prices, rose to 115.58 on Dec. 10, the highest since at least 1986, according to data released yesterday by Nymex. Oil also advanced because the dollar dropped to a seven- week low against the euro. A weaker U.S. currency increases demand for commodities as a hedge and makes raw materials cheaper for buyers with euros, yen or sterling. The dollar weakened 2.3 percent to $1.3316 per euro from $1.3023 Dec. 10. The Paris-based IEA, an adviser to 28 nations, said global oil demand will contract this year for the first time since 1983 and reduced its outlook for 2009. Consumption worldwide will shrink in 2008 by 200,000 barrels a day, or 0.2 percent, the IEA said in a monthly report yesterday. Next year’s growth may be wiped out if the economic slump deepens, the agency said. Brent crude oil for January settlement increased $4.99, or 12 percent, to settle at $47.39 a barrel on London’s ICE Futures Europe exchange, the biggest one-day gain since March 1998. Dec. 12 (Bloomberg) -- The dollar headed for its biggest weekly decline in eight years against the euro on speculation U.S. lawmakers will delay voting on legislation to lend the country’s automakers enough money to survive into the new year. The greenback was also set for its sixth weekly decline versus the yen, the longest streak in four years, as Democrats and Republicans opposed to the $14 billion bailout made an alternative proposal, casting doubt on whether the current bill will pass the Senate. The euro rose against the yen this week after European Central Bank council member Axel Weber signaled the bank may be near the end of its rate-cutting cycle. The dollar traded at $1.3317 per euro as of 9:28 a.m. in Tokyo from $1.3352 late yesterday in New York, when it reached a seven-week low of $1.3405. It fell 4.5 percent this week. The dollar bought 91.46 yen, little changed from late yesterday and down 1.5 percent from Dec. 5. Against the British pound, the dollar traded at $1.5011 from $1.5036 yesterday and $1.4685 at the end of last week. The euro was quoted at 121.76 yen, on course for a 3.4 percent gain this week. The dollar may fall to $1.38 per euro and 88 yen this month, Amikura said. The ICE’s Dollar Index, which tracks the greenback against the euro, the yen, the pound, the Canadian dollar, the Swiss franc and Sweden’s krona, fell 1.9 percent yesterday to 83.834. It touched 88.463 on Nov. 21, the highest since April 2006. The dollar gained 9.6 percent against the euro in 2008 as the credit-market seizure and $980 billion of losses on mortgage- related securities worldwide led investors to seek funding in the greenback. The U.S. currency will weaken to $1.45 per euro and 90 yen, strategists led by Jens Nordvig in New York wrote in a research note yesterday. The firm previously forecast that the dollar would trade at $1.30 and 105 yen by the end of next year. General Motors Corp. and Chrysler LLC are racing against the clock as they need federal aid to keep from running out of cash early next year. Pressure is mounting on GM as a small number of partsmakers ask for payments in advance, people familiar with the matter said. The Republican’s alternative proposal, offered by Senator Bob Corker, would require automakers’ bondholders to take 30 cents on the dollar and would set wages similar to those paid by foreign companies such as Volkswagen AG. Some Senate Republicans threatened to block the House Democrats’ plan and a revised Senate version because there’s not enough authority to force automakers to cut costs. The House passed the bill on Dec. 10. The dollar may decline to $1.35 versus the euro and to $1.53 per British pound in coming days, BNP forecast. FCPO 3rd month February futures contract rose RM49 to closed RM1644 as compare to previous trading session with 5325 lots traded in the market. CPO price was open lower than expectation as crude oil and soybean oil close firm during overnight trading but CPO price seem traded higher as foreign commodity market electronic trading higher during trading session. Technically, CPO price seems encounter great selling pressure around RM1680 region after been trading higher for 4 consecutive trading sessions. We expect CPO price would be trading within the hourly trend line price range as market seems need some fresh leads to boost up for price movement. Traders were advice to take profit from the previous long position provided if resistance levels at RM1700 and RM1720 were not violated. Nearest supports were seen at RM1620 and RM1575 region while critical support seems at RM1400 region. FKLI November futures contract close unchanged as compare previous trading session to close at 859 with total of 5228 lots traded in the market. FKLI was opened lower during trading session due Nikkei indices and Dow Jones futures weak trading. However, FKLI later trading higher as Ringgit was trading stronger as compare to US dollars. 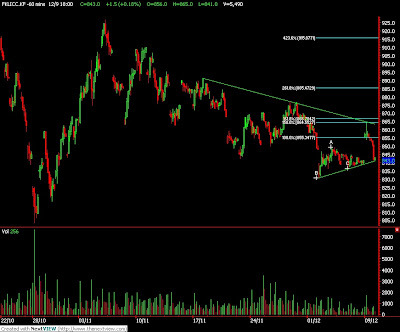 Technically, FKLI price was manage to hold well above 61.8% Fibonacci retrace figures at 851 before surge up and challenge the resistance trend line around 860.5 regions. As of our expectation, 860 levels was one of the great resistance levels other than 877 and 891 region. However, we would recommend traders to hold long position in the coming trading session around the support levels at 855 and 848 region while assume that uptrend only remain provided if support levels were not violated. MUMBAI, Dec 11 (Reuters) - India soybean and soyoil futures, which hit upper circuit in the previous session, may extend gains on Thursday tracking a firm overseas market and hopes of a re-imposition of import duty on crude palm oil, analysts said. India, the world's biggest vegetable oil importer after China, could tax crude palm oil shipments within a month, top industry analyst Dorab Mistry said last week. Palm oil and soyoil prices usually move in tandem as they are substitutes. At 9:21 a.m., the February palm oil futures contract KPOc3 on the Bursa Malaysia Derivatives Exchange was up 1.57 percent at 1,620 ringgit per tonne. Soybean January futures contract SF9 on the Chicago Board of Trade (CBOT), was up 0.09 percent at $8.30 a bushel in electronic trade. January soybean NSBF9 on the National Commodity and Derivatives Exchange closed up 3.55 percent at 1,737 rupees per 100 kg in the previous session on Monday. Soyoil for January delivery NSOF9 ended at 473.65 rupees per 10 kg, up 3.97 percent. Lower arrivals in the physical market may also support the upside. Dec. 10 (Bloomberg) -- Gold jumped the most in two weeks on speculation a weaker dollar and higher commodity costs will boost demand for the precious metal as a hedge against inflation. Silver also gained. The dollar fell for the second time in three days against a basket of six major currencies. The Reuters/Jefferies CRB Index of 19 raw materials climbed as much as 3.2 percent. Gold reached a record in March as the CRB headed to an all-time high in July and the dollar fell to a record against the euro. Gold futures for February delivery rose $34.60, or 4.5 percent, to $808.80 an ounce on the Comex division of the New York Mercantile Exchange, the biggest gain since Nov. 21. The price is up 7.5 percent this week. Silver futures for March delivery climbed 35 cents, or 3.6 percent, to $10.20 an ounce. “You’ve got support for gold as the dollar begins to fall,” said Frank McGhee, the head dealer at Integrated Brokerage Services LLC in Chicago. The Federal Reserve probably will lower its benchmark lending rate 50 basis points to 0.5 percent on Dec. 16, according to the median estimate of 72 economists surveyed by Bloomberg News. The federal-funds rate was at 5.25 percent in September 2007 before the Fed began slashing borrowing costs. Gold and most commodities generally move in the opposite direction of the dollar. The U.S. Dollar Index fell as much as 0.8 percent against the basket of currencies. The gauge is still up 11 percent this year, headed for the first annual gain since 2005. Gold has dropped 3.5 percent this year, while silver was down 32 percent. Gold climbed to a record $1,033.90 on March 17. Gold’s decline is the smallest among 16 commodities in the CRB in 2008. Crude oil and copper are down by more than half. Only cocoa, hogs and sugar have posted gains. Treasuries fell today, snapping a rally that pushed three- month bill rates below zero. Dec. 11 (Bloomberg) -- Crude oil climbed above $44 a barrel, extending a rally into a second day, on speculation that the economy and energy demand will recover as U.S. lawmakers hammer out a $15 billion rescue of automakers. Oil rose as congressional Democrats and President George W. Bush’s administration reached an agreement on the plan. Prices advanced earlier this week because of President-elect Barack Obama’s pledge to enact the biggest U.S. public works program in half a century. Crude oil for January delivery rose as much as 72 cents, or 1.7 percent, to $44.24 a barrel and traded at $43.85 at 10:48 a.m. Sydney time on the New York Mercantile Exchange. It gained $1.45, or 3.4 percent, to $43.52 a barrel yesterday. Futures, which have dropped 54 percent this year, are heading for the biggest annual decline since trading began in 1983, as global economies falter. U.S. House of Representatives Speaker Nancy Pelosi said she plans to have a vote on the auto bill in the House, where Democrats have a large enough majority to make passage likely. Implied volatility for January crude oil, the major factor in determining options prices, rose to the highest in more than 22 years Dec. 9 in a sign that traders anticipate more big moves in oil futures. Implied volatility rose to 114.41, the highest since at least 1986, according to data released yesterday by the New York Mercantile Exchange. Implied volatility for less-heavily traded February oil was 96.62, also a 22-year high for the second-most active trading month. January oil options expire Dec. 16. Oil also rose yesterday after Russia signaled it may coordinate an output cut with OPEC next week to end the five- month, $100 slump in prices. Energy Minister Sergei Shmatko said Russia will announce proposals for reducing production by Dec. 17, when OPEC meets, Interfax reported. The group, source of more than 40 percent of the world’s oil, may trim output by as much as 2.5 million barrels a day, next week, billionaire hedge-fund manager Boone Pickens said Dec. 9. Shmatko said he had spoken on the phone to the president of the Organization of Petroleum Exporting Countries and that the group is preparing “significant” supply reductions, Interfax said. Russia is the world’s second-largest exporter after Saudi Arabia. Norway, the next biggest non-OPEC exporter, has no plans to lower production, the petroleum ministry said. OPEC should make a “substantial” output cut when it meets on Dec. 17 in Algeria, Shokri Ghanem, Libya’s top oil official, said on Dec. 8. Oil has tumbled 29 percent since the group announced a 1.5 million-barrel-a-day supply reduction on Oct. 24. Prices dropped earlier yesterday after the U.S. government released a report that showed inventories of gasoline and distillate fuel, a category that includes heating oil and diesel, climbed last week as refineries increased operating rates and demand dropped. Gasoline stockpiles rose 3.7 million barrels to 202.7 million barrels in the week ended Dec. 5, the Energy Department said yesterday in the weekly report. Distillate inventories climbed 5.6 million barrels to 130.6 million. Gasoline supplies were forecast to fall 400,000 barrels and distillate supplies by 1.5 million barrels, according to a Bloomberg News survey. Inventories of crude oil rose 392,000 barrels to 320.8 million, the department said. Supplies were forecast to increase by 1.3 million barrels, according to the median of 14 responses in the Bloomberg News survey. Refineries operated at 87.4 percent of capacity, up 3.1 percentage points from the week before. Brent crude oil for January settlement increased 87 cents, or 2.1 percent, to settle at $42.40 a barrel on London’s ICE Futures Europe exchange yesterday. Dec. 11 (Bloomberg) -- The yen may gain against the dollar on speculation a lack of Republican support for a bailout of U.S. automakers will prompt investors to pare holdings of assets funded with Japan’s currency. The yen may also rise versus the euro after Republican Senator George Voinovich said yesterday legislation to provide $15 billion in federal loans to General Motors Corp. and Chrysler LLC may not have enough votes from his party to pass the Senate. The Australian dollar may decline before a report that economists say will show the country’s jobless rate climbed to the highest in a year as the threat of a global recession damped trade. The yen was little changed at 92.83 per dollar as of 8:40 a.m. in Tokyo from late yesterday in New York. It rose to 91.60 on Dec. 5, the highest level since Oct. 24. Against the euro, the yen was quoted at 120.82 from 120.78. The euro bought $1.3011 from $1.3023. The yen may rise to 91 against the dollar today, Tokyo-based Matsumoto said. State Street Global Markets recommended investors erase bets that the dollar will gain versus the euro as major central banks’ interest rates are “nearing the bottom.” Policy makers in Canada, Europe, the U.K., Sweden, Australia and New Zealand lowered interest rates this month. “Narrowing interest-rate differentials will soon fade as a force in the foreign-exchange market,” Dwyfor Evans, a Hong Kong-based currency analyst at the company, wrote in a research note to clients yesterday. The dollar may extend its decline as the U.S. government increases its budget deficit by spending “trillions of dollars” to revive the economy, according to Bill Gross, manager of the world’s biggest bond fund at Pacific Investment Management Co. in Newport Beach, California. The ICE’s Dollar Index, which tracks the greenback against the euro, the yen, the pound, the Canadian dollar, the Swiss franc and Sweden’s krona, fell 0.4 percent to 85.484 yesterday. It touched 88.463 on Nov. 21, the highest since April 2006. The Bush administration is lobbying Republican lawmakers to support a plan to rescue General Motors and Chrysler, officials said. Legislation in the House of Representatives calls for the appointment of a car czar who may force the automakers into Chapter 11 bankruptcy if the companies don’t come up with a restructuring plan by March 31. The yen gained this year against all 178 currencies tracked by Bloomberg as the global recession encouraged Japanese investors to repatriate funds. The yen appreciated 20 percent versus the dollar, 35 percent against the euro and 66 percent against Brazil’s real as so-called carry trades unwound. The dollar gained 12 percent against the euro this year as the credit-market seizure and $980 billion of losses on mortgage-related securities worldwide led investors to repatriate overseas investment to the U.S. and seek shelter in government debt. FCPO 3rd month February futures contract rose RM40 to closed RM1595 as compare to previous trading session with 5460 lots traded in the market. CPO price was opened higher due to crude oil and soybean oil strong electronic trading during the trading session. Technically, as our expectation, CPO price was traded higher during previous trading session and seems to encounter great resistance around RM1600 levels; but manage to hold above 61.8% Fibonacci retrace levels at RM1577. We expect CPO price would trade higher in the coming trading session provided if support levels at RM1570 and RM1490 region were not violated. 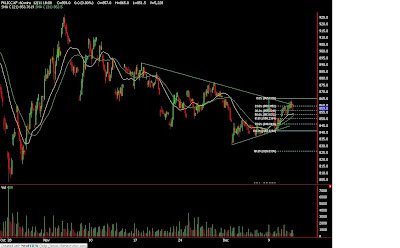 However, traders were advice hold long position once CPO price was seems support while being cautious around hourly CPO price trend line at RM1680 and RM1723 regions. FKLI November futures contract surge 16 points higher as compare previous trading session to close at 859 with total of 7345 lots traded in the market. FKLI opened marginally lower 1 point and continue traded upwards due Nikkei and Dow Jones electronic trading during the trading session. Technically, FKLI was rested above trend line in hourly price chart while RSI shows support at 40 for RSI(12) further confirm by stochastic after an hourly later. As per our previous commentary, we expect FKLI would trade higher towards 940 regions ONLY provided if hourly resistance trend line was being violated. Next resistance levels were seen at 877 and 891 regions after 860 levels. 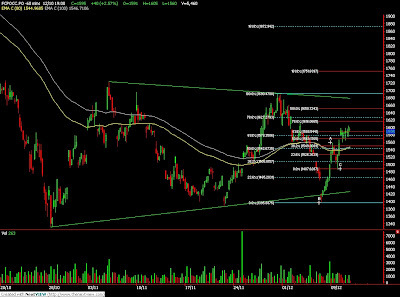 Traders were advice to hold long position around the support levels at 850 and 840 regions. KUALA LUMPUR, Dec 10 - Malaysia will sell palm biodiesel at domestic fuel pumps by January 2010, Commodities Minister Peter Chin said on Wednesday, adding that the government was in talks with independent power producers on burning palm oil as biodiesel. Dec. 9 (Bloomberg) -- Gold rose for the second straight day on speculation that the dollar’s rally will stall, boosting the appeal of the precious metal as an alternative investment. Silver declined. The dollar rose as much as 1.1 percent against a weighted basket of six major currencies before paring gains. The greenback dropped 1.8 percent yesterday. Gold is still headed for the first annual decline since 2000, while the dollar is poised for the first gain in three years. Gold futures for February delivery rose $4.90, or 0.6 percent, to $774.20 an ounce on the Comex division of the New York Mercantile Exchange. The price climbed 2.3 percent yesterday after slumping 8.2 percent last week. Silver futures for March delivery dropped 12.5 cents, or 1.3 percent, to $9.85 an ounce. The metal jumped 5.8 percent yesterday after sliding 7.8 percent last week. The most-active contract is down 34 percent this year. The Federal Reserve will lower its benchmark lending rate 50 basis points to 0.5 percent on Dec. 16, according to the median estimate of 71 economists surveyed by Bloomberg. The federal-funds rate was at 5.25 percent in September 2007 before the Fed began slashing borrowing costs. Gold reached a record $1,033.90 on March 17 after rate cuts helped send the dollar to a record against the euro in July. Gold and most commodities generally move in the opposite direction of the U.S. currency. The metal is down 7.6 percent this year, while the dollar has gained 12 percent against the basket of currencies. “Gold is being pushed back and forth by the dollar,” said Frank Lesh, a trader at FuturePath Trading LLC in Chicago. Investment in the SPDR Gold Trust, the biggest exchange- traded fund backed by bullion, is little changed this month after gaining 1.2 percent in November to 758.1 metric tons. The Reuters/Jefferies CRB Index of 19 raw materials has tumbled 40 percent this year. Only cocoa, hogs and sugar have posted gains. Gold has the smallest decline among the other prices for energy, crops and industrial metals. Dec. 9 (Bloomberg) -- Crude oil fell more than $1 a barrel, capping a 23 percent drop since Nov. 26, after the U.S. forecast that annual demand will decline for the first time since 1983. Global consumption will average 85.75 million barrels a day in 2008, down 50,000 barrels from 2007, the Energy Department said in its monthly Short-Term Energy Outlook today. As fuel use drops, OPEC is discussing making the second output cut in less than two months at a Dec. 17 meeting. Crude oil futures for January delivery fell $1.64, or 3.8 percent, to settle at $42.07 a barrel on the New York Mercantile Exchange. Global consumption last fell in each of the four years ended in 1983, according to the department. Demand will decline an additional 450,000 barrels a day next year to 85.3 million barrels a day, the department said. The International Energy Agency and the Organization of Petroleum Exporting Countries have also lowered demand forecasts over the past month because of the economic contraction. The IEA reduced its 2009 estimate by 670,000 barrels a day, or 0.8 percent, to 86.5 million barrels a day in a Nov. 13 report. The agency is scheduled to release its next report on Dec. 11. OPEC cut its forecast for oil consumption next year by 530,000 barrels a day, or 0.6 percent, to 86.68 million barrels a day, in its monthly oil market report on Nov. 17. Oil futures, which have dropped 56 percent this year, are heading for the biggest annual decline since at least 1987, as global economies falter. The International Monetary Fund sees recessions next year in the U.S., Japan and the euro area. U.S. stocks fell after companies from FedEx Corp. to Danaher Corp. forecast earnings that disappointed investors as the recession crimped sales. The Dow Jones Industrial Average declined 242.85, or 2.7 percent, to 8,691.33. The Standard & Poor’s 500 Index dropped 21.03 points, or 2.3 percent, to 888.67. The decline in crude oil has sent both gasoline futures and pump prices lower this year. Gasoline for January delivery fell 2.54 cents, or 2.6 percent, to settle at 93.64 cents a gallon in New York. Futures touched 89.5 cents a gallon on Dec. 5, the lowest since the contract was introduced in October 2005. U.S. pump prices last week fell to $1.699 a gallon, the lowest since February 2004, the Energy Department said yesterday. OPEC should make a “substantial” output cut when it meets, Shokri Ghanem, Libya’s top oil official, said yesterday. OPEC agreed to cut daily output by 1.5 million barrels in October. A government report tomorrow is forecast to show that U.S. crude-oil inventories rose 1.3 million barrels last week, according to the median of 14 responses in a Bloomberg News survey. The report will probably show that U.S. supplies of gasoline and distillate fuel, a category that includes diesel and heating oil, dropped. The Energy Department is scheduled to release its weekly report tomorrow at 10:35 a.m. in Washington. Brent crude oil for January settlement declined $1.89, or 4.4 percent, to settle at $41.53 a barrel on London’s ICE Futures Europe exchange. Dec. 10 (Bloomberg) -- The yen traded near a seven-week high against the dollar on speculation a global economic slump and doubts about a bailout for U.S. automakers will increase the appeal of Japan’s currency. The yen may also advance against the euro on speculation U.S. stock declines will spread to Asia, prompting selling of higher-yielding assets. U.S. Democrats backed off a prediction that Congress would approve a $15 billion automaker bailout within 48 hours due to objections from Republicans. General Motors Corp. and Chrysler LLC may not have strong enough collateral for the Federal Reserve to lend to them, Chairman Ben S. Bernanke said in a letter to lawmakers Dec. 5. The yen traded at 92.21 per dollar as of 8:41 a.m. in Tokyo from 92.13 yesterday. It rose to 91.60 on Dec. 5, the highest since Oct.24. Against the euro, the yen was at 119.16 from 119.07. The euro bought $1.2923 from $1.2927. The yen may rise to 91 per dollar today, Amikura said. The Standard & Poor’s 500 lost 2.3 percent yesterday, halting a two-day advance, after companies from FedEx Corp. to Danaher Corp. forecast earnings that disappointed investors as the deepening recession crimps sales. Senate Majority Leader Harry Reid said the Senate is unlikely to vote tonight in the U.S. on extending government loans and that lawmakers may have to stay in session over the weekend. General Motors and Chrysler say they need at least $14 billion in combined aid to keep from running out of cash by early next year. “The Federal Reserve would be extremely reluctant to extend credit where Congress has actively considered providing assistance but, after due consideration, has decided not to act,” Bernanke said in the letter, a copy of which the Senate banking panel forwarded to Bloomberg yesterday. The yen has gained this year against all 178 currencies tracked by Bloomberg News on speculation the global economic slump and interest-rate cuts will prompt investors to unwind carry trades, in which they get funds in a country with low borrowing costs and buy assets where returns are higher. Japan’s 0.3 percent target rate is the lowest among developed nations. Japan’s currency appreciated 21 percent versus the dollar, 37 percent against the euro and 73 percent versus New Zealand’s dollar this year. It’s headed for its first annual gain versus Brazil’s real, the euro and the New Zealand dollar in at least six years. The stronger yen has eroded Japanese exporters’ revenue. Sony Corp, the world’s second-biggest consumer-electronics maker, said yesterday it plans to eliminate 16,000 jobs. It said on Oct. 23 that net income will probably drop 59 percent in the year ending March 31. The dollar has gained 35 percent versus the pound this year and 13 percent against the euro as the credit-market seizure and $980 billion of losses on mortgage-related securities worldwide led investors to repatriate overseas investment to the U.S. and seek shelter in Treasuries. Demand for U.S. government debt pushed the yield on the 10- year note to 2.65 percent today. It reached 2.505 percent on Dec. 5, the lowest level since at least 1962, when the Federal Reserve’s daily records began. The ICE’s Dollar Index, which tracks the greenback against the euro, the yen, the pound, the Canadian dollar, the Swiss franc and Sweden’s krona, rose 0.3 percent to 85.84 yesterday. It touched 88.463 on Nov. 21, the highest since April 2006. FCPO 3rd month February futures contract rose RM56 to closed RM1555 as compare to previous trading session with 6782 lots traded in the market. CPO price was traded wild during trading session as soybean oil and crude oil electronic starts to retrace mildly after traded high in the previous trading session. Technically, as our expectation, CPO price was traded higher after but starts to retrace 38.1% Fibonacci retrace figure at RM1490 region before surge toward RM1560 region again. 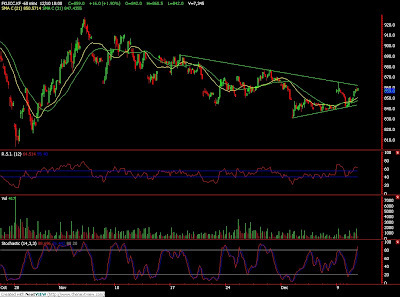 We expect CPO price would be traded sideways towards RM1650 region in a large symmetric triangle formation. Traders were advice continue to hold long position in the coming trading session around support region at RM1500 and RM1530 while being cautious around resistance levels at RM1600 and RM1620. FKLI November futures contract close marginally 1.5 points higher compare to previous trading session at 841.5 with total of 5490 lots traded in the market. FKLI traded lower despite open higher in the morning trading session due regional indices especially Hang Seng index and Dow Jones futures electronic trading retrace after riding on bull rally on previous trading days. Technically, FKLI meet 150% Fibonacci projection at 865 during trading session but traded downwards and rested on the hourly trend line. Based on the hourly FKLI price movement, we expect FKLI would traded upwards in the coming trading session provided critical support levels at 830 and 803 were not violated; same apply to support trend line. However, FKLI were expecting to encounter great selling pressure around 860. Dec. 9 (Bloomberg) -- Gold traded little changed in Asia as the dollar gained, eroding the appeal of the precious metal as an alternative investment. Platinum declined. The dollar advanced as much as 0.5 percent against a weighted basket of six major currencies, paring yesterday’s 1.8 percent loss after U.S. President-elect Barack Obama’s pledge to spend more on infrastructure boosted stocks and reduced the currency’s haven appeal. Bullion for immediate delivery fell 17 cents to $772.53 an ounce at 10:35 a.m. in Singapore. Gold for February delivery added 0.4 percent to $772.50 an ounce in after-hours electronic trading on the Comex division of the New York Mercantile Exchange. Obama pledged Dec. 6 to boost the economy with the biggest public-works spending package since the 1950s, including investment in roads, bridges and public buildings. The dollar was at $1.2868 euro from $1.2963 late in New York yesterday. It reached $1.2563 on Dec. 2, the lowest since Nov. 21. Gold for October delivery dropped 1.9 percent to 2,293 yen a gram ($768 an ounce) on the Tokyo Commodity Exchange at the 11 a.m. local time break. Shanghai gold for June delivery added 0.9 percent to 169.98 yuan a gram ($767 an ounce). Immediate-delivery platinum fell 2.4 percent to $812 an ounce at 10:06 a.m. Singapore time. The metal used in vehicle catalytic converters rose the most in two weeks yesterday after Congressional Democrats sent President George W. Bush a draft proposal for a $15 billion, short-term rescue of U.S. automakers and said it will likely be voted on this week. The metal for January delivery was down 3.3 percent at $815.60 an ounce in New York, and October-delivery platinum on the Tokyo Commodity Exchange lost 5.1 percent to 2,398 yen a gram. “If passage of the plan is delayed, we believe that the platinum group metals might give up considerable ground on disappointed selling,” said Steel. Automakers account for more than 60 percent of global platinum consumption, according to estimates by Johnson Matthey Plc, a London-based metals refiner, trader and researcher. Palladium, as well as platinum, is used to make catalytic converters for car and truck exhaust systems. Among other precious metals for immediate delivery, silver was little changed at $10 an ounce, and palladium was up 2.1 percent at $180.75 an ounce. Dec. 8 (Bloomberg) -- Gold rose, rebounding from the biggest weekly loss since October, as the dollar declined, boosting the appeal of the precious metal as an alternative investment. Silver jumped the most in two weeks. The dollar fell as much as 1.7 percent against a weighted basket of six major currencies. The Reuters/Jefferies CRB Index of 19 raw materials climbed as much as 4.7 percent after President-elect Barack Obama pledged the largest package of public-works spending since the 1950s. Gold futures for February delivery rose $17.10, or 2.3 percent, to $769.30 an ounce on the Comex division of the New York Mercantile Exchange. The metal fell 8.2 percent last week, the most since Oct. 17. Silver futures for March delivery rose 54.5 cents, or 5.8 percent, to $9.975 an ounce, the biggest gain since Nov. 24. The metal is still down 33 percent this year. Gold and other commodities often move in the opposite direction of the dollar. Gold is heading for the first annual loss since 2000, while the greenback is poised for the first gain since 2005. The dollar index has gained 12 percent this year, while gold dropped 8.2 percent. For the metal to sustain a rally, the dollar has to weaken further, analysts at Deutsche Bank AG said in a report on Dec. 5. Since the collapse of Lehman Brothers Holdings Inc. in September, gold has traded as high as $936.30 on Oct. 10 and as low as $681 on Oct. 24. Some investors sold gold futures to raise cash and cover losses in other markets. The Standard & Poor’s 500 Index has dropped 39 percent this year. “Gold is still vulnerable to another round of asset deleveraging,” McGhee of Integrated Brokerage Services said. Investment in the SPDR Gold Trust, the biggest exchange- traded fund backed by bullion, was little changed last week at 757.9 metric tons. The record was 770.6 tons on Oct. 10. Oil Extends Gains After Obama Pledges Spending Boost for U.S.
Dec. 9 (Bloomberg) -- Crude oil extended its gains after rallying for the first day in seven yesterday on President-elect Barack Obama’s pledge to revive the economy with the biggest U.S. public works program in a half century. Commodities, including oil, copper and corn, climbed on speculation spending on roads, bridges and repairing school buildings will boost raw material demand. Congress and President George W. Bush also are close to agreeing on a $15 billion rescue of U.S. automakers that may be signed this week. “The markets are cheered by the move to bail out the automobile industry and the emphatic statements from the Obama team that are pointing to a massive stimulus package,” said Michael Fitzpatrick, vice president for energy risk management at MF Global Ltd. in New York. Crude oil for January delivery rose 17 cents, or 0.4 percent, to $43.88 a barrel at 10:28 a.m. Sydney time on the New York Mercantile Exchange. Yesterday, futures increased $2.90, or 7.1 percent, to $43.71 a barrel. They touched $40.50 on Dec. 5, the lowest since Dec. 13, 2004. Prices have fallen 70 percent since reaching a record $147.27 in July. Obama, in a television interview Dec. 7 on NBC, reiterated his commitment to the biggest investments in the nation’s infrastructure since President Dwight D. Eisenhower created the interstate highway system in the 1950s. The U.S. president-elect takes office on Jan. 20. A proposal unveiled yesterday by congressional Democrats would require the president to appoint a person or board to oversee long-term restructuring of the auto industry as a condition for receiving federal aid. General Motors Corp., Ford Motor Co. and Chrysler LLC would be eligible for loans. White House and congressional leaders said a final accord was likely yesterday and the House and Senate will return for special sessions this week to vote on the package. Stocks rallied worldwide, led by commodity producers, on Obama’s pledge to increase infrastructure spending. The Dow Jones Industrial Average rose 298.76, or 3.5 percent, to 8,934.18. The Standard & Poor’s 500 Index increased 33.63 points, or 3.8 percent, to 909.70. Last week, oil fell the most since 1991 and metal prices slumped after economic data showed the recession is getting worse. The U.S. economy lost 533,000 jobs in November, bringing job losses this year to 1.91 million. Copper futures for March delivery rose 1 cent, or 0.7 percent, to $1.5080 a pound on the Comex division of Nymex. Yesterday, they added 12.45 cents, or 9.1 percent, to settle at $1.498 a pound, the biggest one-day increase since Oct. 29. Corn futures for March delivery rose 20.75 cents, or 6.7 percent, to settle at $3.30 a bushel yesterday on the Chicago Board of Trade. The Reuters/Jefferies CRB Index of 19 raw materials climbed 5.2 percent to 219.36 yesterday. The gauge lost 54 percent since reaching a record in July as the credit crunch choked worldwide growth. Natural gas futures in New York fell for a fifth day after Dow Chemical Co., the largest U.S. chemical maker, said it plans to shut plants and cut jobs because of declining sales. Gas was up 3.4 cents, or 0.6 percent, to $5.600 per million British thermal units at 10:08 a.m. in Sydney. It fell 17.6 cents, or 3.1 percent, yesterday to settle at $5.566 per million in New York. Libya’s top oil official, Shokri Ghanem, said yesterday that the Organization of Petroleum Exporting Countries should make a “substantial” output cut at its meeting in Algeria. 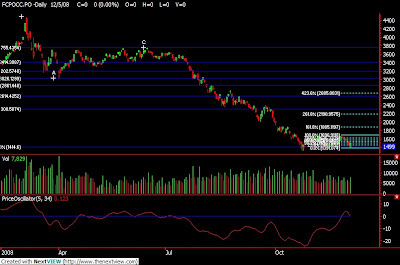 Saudi Arabian Oil Co. announced yesterday it will reduce crude oil supplies to Japan in January for a second month. Saudi Aramco is the world’s largest state oil company. OPEC pumps more than 40 percent of the world’s oil and agreed to cut daily output 1.5 million barrels in October as prices slumped and inventories rose. Chakib Khelil, OPEC president, said on Dec. 6 that the group may make a “severe” reduction in production to stem the 70 percent decline in prices from July’s record. Brent crude oil for January settlement rose $3.68, or 9.3 percent, to settle at $43.42 a barrel on London’s ICE Futures Europe exchange. Dec. 9 (Bloomberg) -- The yen traded near a one-week low against the euro on speculation official efforts to tackle the global economic crisis will boost Asian stocks and reduce the Japanese currency’s appeal as a safe haven. The yen was near a one-week low against the New Zealand dollar after Governor-General Anand Satyanand said the nation will cut taxes and boost construction to spur growth. Congress and the administration of President George W. Bush negotiated a $15 billion rescue of U.S. automakers. The euro fell against the dollar before German economic sentiment data that may show pessimists outnumbered optimists for the 17th month. The yen traded at 120.06 per euro as of 8:11 a.m. in Tokyo from 120.26 late yesterday in New York, when it fell to 120.96, the lowest since Dec. 1. Against the dollar, it was little changed at 92.95. The euro declined to $1.2920 from $1.2963. Japan’s currency traded at 50.77 per New Zealand dollar, little changed from late yesterday in New York, when in declined to a one-week low of 51.21. In carry trades investors obtain funds in a country with low borrowing costs and buy assets where returns are higher. Japan’s 0.3 percent target rate compares with 2.5 percent in Europe and 5 percent in New Zealand. The Standard & Poor’s 500 Index jumped 3.8 percent yesterday. Japan’s yen traded in the opposite direction of the index more than 90 percent of the time in the past month, data compiled by Bloomberg show. Implied volatility on one-month dollar-yen options fell for a fifth straight day, dropping to 20.46 percent, indicating investors see less price fluctuation in the currency pair next month. The index jumped to 41.79 percent on Oct. 24, the highest level since 1995, when Bloomberg started to compile the data. A drop in volatility reduces the risk of the carry trade by making profits easier to predict. New Zealand will cut income taxes by NZ$4.4 billion ($2.4 billion), increase road and school construction to help the economy out of recession, the government said today. In an NBC television interview on Dec. 7, Obama reiterated his commitment to the biggest investments in the nation’s infrastructure since the 1950s. The U.S. president-elect takes office Jan. 20. The European Union proposed a 200 billion euro ($258 billion) stimulus package last month. Congressional lawmakers met yesterday and over the weekend to work out a rescue package for the big U.S. automakers, General Motors Corp., Chrysler LLC and Ford Motor Co. The rescue plan, which will offer automakers $15 billion in loans intended to help them survive at least until March, is likely to be passed and signed into law this week, House Financial Services Committee Chairman Barney Frank said yesterday. Investor confidence in German’s economy, Europe’s largest, worsened in December, the ZEW Center for European Economic Research’s index of investor and analyst expectations will probably show today. The index fell to minus 57 from minus 53.5 in the previous month, according the median estimate of 38 economists in a Bloomberg News survey. FCPO February futures contract rose RM37 higher compare to previous trading session and close at RM1499 with a total 7829 lots traded in the market. CPO price recovered despite of crude oil plunge during overnight trading session. Technically, CPO price manage to hold against the selling pressure above the support level at RM1410 after been tested the 3rd time on 78.6% Fibonacci retracement figures and C wave complete and 161.8% Fibonacci projected figures. Traders were advice to hold long position in the coming trading session for long term positioning as we expect CPO price would be riding on bull rally in the coming trading session. 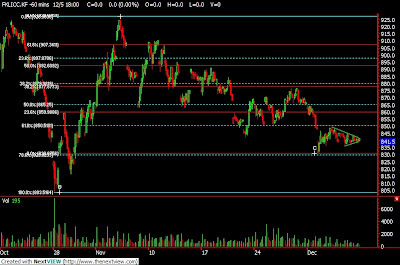 However, critical support levels at RM1400 must not be violated in the coming trading session. 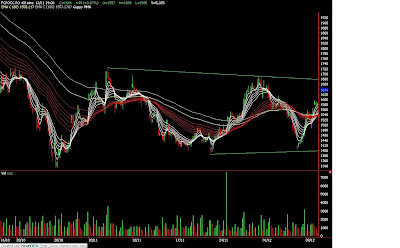 Resistances were seen at RM1510 and RM1580 region. FKLI November contract close marginally 1.5 points lower compare to previous trading session at 841.5 with a total of 3008 lots traded in the market. FKLI was traded sideways during trading session due to long public holidays ahead despite world indices remain open on Monday. Technically, FKLI seems traded in the symmetric triangle in the hourly while remain supported above 78.6% Fibonacci figure at 830 levels. 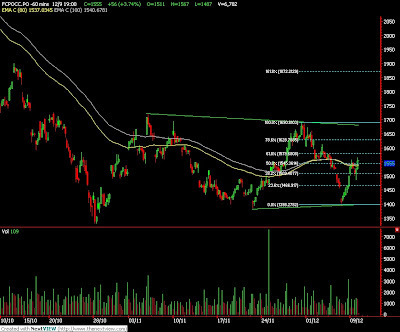 We expect FKLI would traded higher towards 877 region provided if support levels at 830 and 805 were not violated. Traders were would advice to hold long position in the coming trading session while being cautious around the resistances level at 860 and 877 region.